The paddle steamer Queen of the North was built at Laird Brothers in Birkenhead in 1895 for the Blackpool Passenger Steamboat Company, their newest excursion boat was touted as one of the fastest of her kind, she could make a little over 20 knots. She served the company until Mar. 29, 1916 when the steel hulled ship was requisitioned by the Admiralty for use as a minesweeper. SMS UC-4 was a busy and successful minelaying submarine sinking 36 ships for over 44,000 tons, HM PMS Queen of the North was one of them. She hit one of the mines on July 20, 1917 when twelve miles off Orford, Suffolk. Only three of the crew survived, one man, Charles J. W. Bristow was awarded the Royal Humane Society Medal Silver for Bravery for his effort in saving the lives of the other two men. My grandfather (Charles John William Bristow) was a ship's engineer on the Queen of the North when she hit a mine in the North Sea on 20 Jul 1917. There were three survivors from this disaster: my grandfather Charles, T. H. Dawson and James Bray. 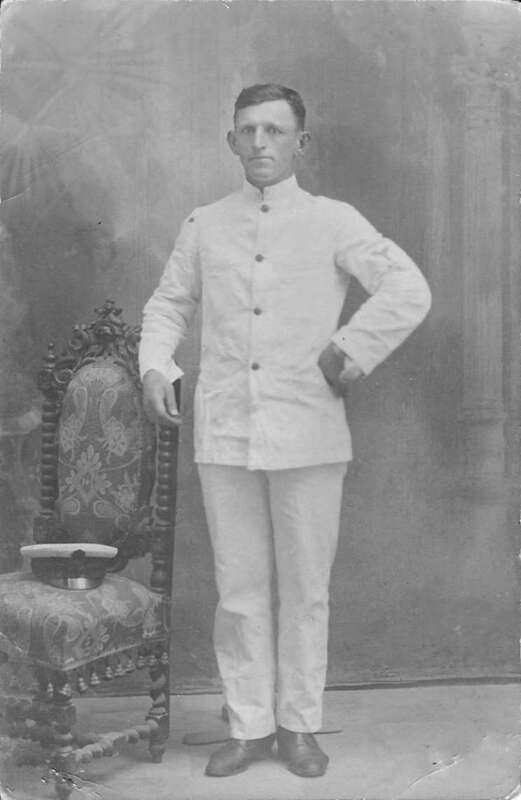 My grandfather, who was a second generation Australian and worked on boats around Australia and further a field until he went to the UK around 1900. He worked out of Hull on fishing trawlers and much later on the Queen of the North. He was a keen sportsman, particularly bike riding and swimming. Apparently he swam nearly every day around Point Eaglehawk in Eastern Victoria, because he was such a good swimmer and believed in physical fitness he was able to save Bray and Dawson from drowning on that day in 1917. He was recommended for, and received the Silver Medal from Royal Humane Society. See below a copy of the citation from the Royal Humane Society. Charles J. W. Bristow - At 1.38 p.m. on the 20th July, 1917, H.M. P.M.S. "Queen of the North" was blown up by an enemy mine in the North Sea and sank in 30 seconds. Charles J. W. Bristow, who with others of the crew was thrown into the water, seeing T. H. Dawson being taken under by the suction of the sinking vessel, at once dived and brought him to the surface, where he placed him on an upturned boat, He then saw James Bray, another of the crew, in difficulty, and finding a life-belt he put this on him. After this he saw a life-raft about 100 feet away, and swimming to this managed to bring it back, and got Dawson and Bray safely on to it, whence they were ultimately picked up. There was great risk from the suction of the sinking vessel, and afterwards from the floating wreckage. The Silver Medal was voted to Charles J. W. Bristow. While searching for a picture of the Queen of the North I came across the MaritimeQuest site with information about the Queen of the North. My grandad, Alfred Solly Engineer sub-lieutentant RNR, was one of the crew who lost his life in 1917 when the ship sank. He had also prepared her in Preston dock after she was requisitioned by the Admiralty, several letters remain with instructions from Mr. Bickerstaffe of the Blackpool Passenger Steamboat Company for preparing both the Greyhound and the Queen of the North for war. While getting the boats ready my grandfather's address was Mr. A. Solly The Dock Preston. I have copies of some letters sent after the sinking to my Grandmother- one from G. Kayley Commander Auxiliary Patrols -HMS Ganges Harwich on July 25, 1917 and also one on the 1 August outlining what had happened. Quote" Her Consort lowered their boats with most commendable promptitude and picked up nineteen survivors including a sub-lieutenant who had joined the boat two days previously, of the 29 lost nothing was seen, except the next day one body was recovered, that of James Stephen 2nd hand and was taken to Scotland for burial." Hope this will add a little more history for the Queen of the North.